For Crazy For You , I saw Bobby Child as relentless, optimistic, and bold albeit his naivete and inexperience. It was important for me to show how New York City was deeply dissatisfying for him and how Nevada was in need of someone as stubborn as him. Bobby's arc throughout the play needed to reflect his development as a legitimate and visionary leader by the sheer necessity of the circumstances in Nevada, both with Polly's financial situation as well as her disdain for him. Also, I was interested in breaking the convention of glamour within the NY scenes by placing the first scene in the back alley rather than in front of the theatre and using a detachable escape staircase rather than a stretch limo in the dream sequences. 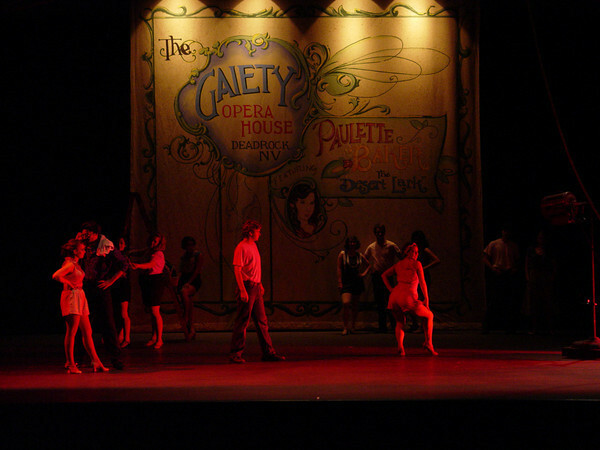 In "I Can't Be Bothered Now," I reflected Bobby's affection and respect for the chorus girls and his mischievous nature by putting them in a play on a man's suit rather than pink Follies-esque costumes in order to create legitimacy while commenting on his mother and fiance's continued pleas for him to pursue business.